Netball - 15. November 2007. 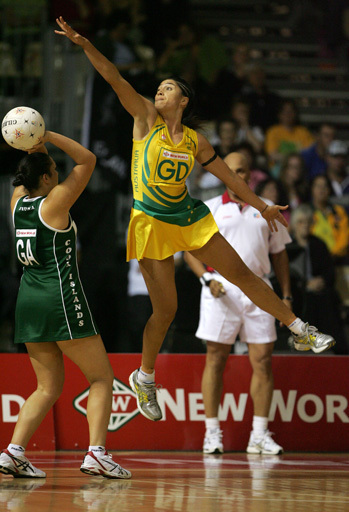 Australia produced an all-encompassing performance to advance to the semi-finals when they dispatched the Cook Islands 90-22 at the New World Netball World Championships in Auckland today. The No. 2 ranked team issued an ominous warning when they burst out of the blocks with a near-faultless opening quarter of ruthlessly efficient netball. All the hallmarks of slick Australian play were in evidence today as they steamrolled to a 25-6 first quarter advantage displaying all of the speed and timing for which they are renowned. Star shooter Sharelle McMahon was left on the bench with the injured Selina Gilsenan, but Australia showed their stocks run deep with Susan Pratley (goal attack) and Julie Prendergast proving more than worthy replacements. The speed of the von Bertouch sisters – Laura and Natalie - in the midcourt, the slick interplay between shooters Catherine Cox and Pratley and the defensive capabilities of the outstanding back three of Prendergast, Mo’onia Gerrard and captain Liz Ellis conspired to make the quarter-final outing a torrid one for the Cook Islands. The procession continued with Australia keeping their foot to the floor as they headed into halftime 46-12 ahead and 71-14 at three-quarter time. McMahon made an appearance in the second half, one of four changes, which had little effect on Australia’s overall dominance as the Cooks were starved of ball. The Cook Islands found it difficult to cope with Australia’s devastating speed on attack while at the other end of the court they were undone by a menacing and tenacious defensive line. Australia were able to keep the Cook Islands scoreless for long periods as their own stockpile of goals continued to mount. “We set ourselves challenges all the way through and what was really important for us was we were able to change the game up,’’ Ellis said. “It ‘s not so important to continue to rack up the goals as it is to make sure you’re achieving what you want to through the game.